There are many methods are defined to nasal tip lifting. Some of them is not permanent but practical and some of them permanent but painful or have some risks. 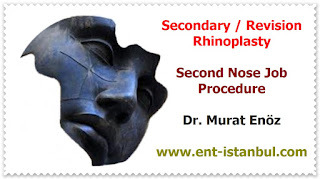 I prefer to simple nose tip lifting method expecially in my pateints who is come for septoplasty surgery with nasal tip pitosis. ﻿The external strut graft is a practical, simple and easy cartilage graft application used to lift the tip of the nose upwards. The cartilage graft used to lift the tip of the nose is taken from the nasal septum cartilage. No industrial product is used. 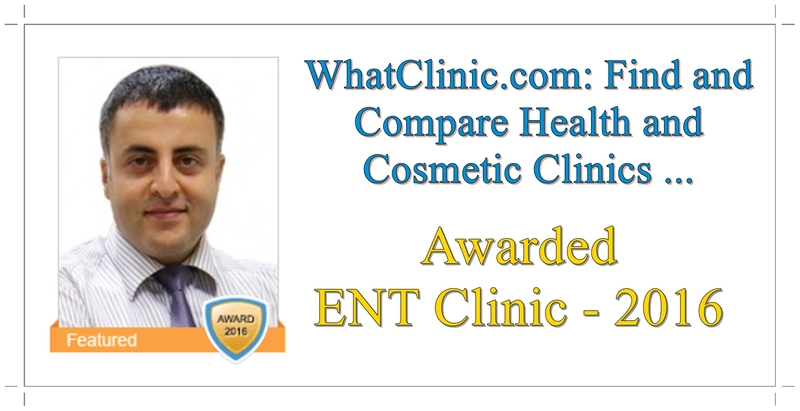 ﻿Nose aesthetic surgeries should be specially designed for the individual. Nasal tip lifted may be suitable for patients with no big nasal hump and thin droopy nasal tip. This simple technique is not suitable for wide and thick nasal tip and with big nasal hump. What is a columellar strut graft and how is it inserted? Columellar strut graft is a cartilaginous graft a few centimeters long and a few millimeters wide, placed between the between the medial crura of the alar cartilages and it taken from the nasal septum. Strut graft is usually placed also while operations of nose tip plasty and rhinoplasty. This graft is the most commonly used grafts in rhinoplasty surgery. 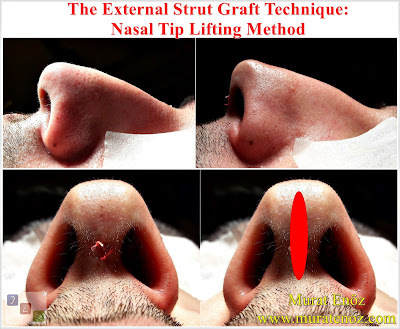 Strut grafts are used to increase the support of the nose tip and to increase the nose tip projection. The bottom of this graft should come into contact with the crista maxillaris anterior. There may be different stitch techniques used by each surgeon after placing this graft. When properly applied, the strut graft may allow the nose tip lifting as naturally. This graft is especially recommended when the nose tip is low (low type) and the or is weak supported nose tip. Prevents nose sagging (drooping) during smile and provides a sympathetic smile. Unlike classical strut graft placing, external strut grafting is done from outside without any nasal cartilage being exposed. After the vertical incision is made about 5 mm in length on the columella skin at the midline, this graft is inserted by tunneling up and down. In the above photo, a patient with advanced cartilaginous curvature is seen with strut grafts prepared from septal cartilages. During the open technique nose aesthetic surgery. Since this graft is flat, the directions of curvature of both cartilages are erected in opposite directions. This graft can be inserted under the local anesthesia and The process was terminated without bumper and without bandage. However, I generally prefer to perform this procedure when I performed a septoplasty. In this way, both aesthetic and functional result can be taken at same time. How do external strut grafts affect the appearance of the nose tip? The external strut graft causes the tip of the nose to turn upwards (increase the projection of tip and little bit nasolabial angle) and causes the nose tip to naturally look plump. When viewed from the side of the nose tip, it is seen as erect. What are the advantages of external strut grafting? The nasal tip, after application of the external strut graft, is lifted. † It can be done with nasal septum deviation surgery. In the above photographs, the external strut graft method shows the nose photograph of the patient who has been made to the nasal tip cartilage filling and the procedure has been terminated without any buffer, bandage and nose wrap. Persistent filler materials used for nose have risks such as allergic reaction, tissue necrosis and permanent skin tone changes. In transient nasal filler materials,the procedure is transient. It has to be repeated within 6 months at most. I mean, we have to inject our body with a foreign substance repeatedly. In the external strut graft method, the part of the cartilage taken from the nose septum of the patient is placed at the tip of the nose. There is no need to be concerned about the nose. It is sufficient to throw aesthetic dies that remain only for 2-3 weeks for 1 week at the incision area of ​​approximately 5 mm wide at the tip of the nose. In this method, no artificial material, industrial product and sewing thread are placed in our body. Completely nose removal is done with the patient's own cart. The process of lifting the nose tip upwards from the tip of the nose to the upper zone using permanent suture materials from the skin is called the "nose lift with suture" method. Keep the tip of your nose upright for life. When botox is made to the upper region of the nose where the muscle group pulling the tip of the nose down is to the nose zone and the muscles pulling the tip of the nose to the sides, a slight stifle at the tip of the nose and a more pronounced nose appearance during the laughing can be obtained. This method is also temporary. Recurrent applications are required. The general disadvantages of getting a medical product into the body over and over again and obtaining a decreasing effect are the disadvantages. In the external strut graft method, since the nose is directed forward, the obstruction area in the nasal valve region, which is the narrowest region of the nose, is also relaxed and the nose air passage is increased. It is a permanent and natural method. This method is suitable for patients with thin and slightly drooping nose tips. Patients with has wide and severe drooping nose tips are not suitable for this method.